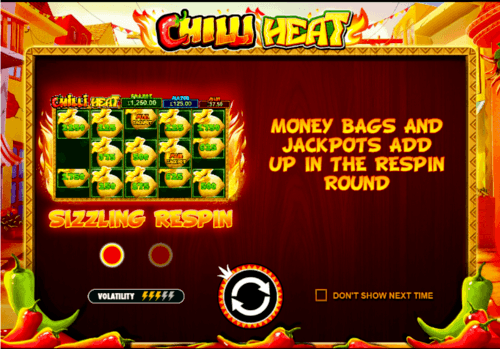 Chilli Heat is a Pragmatic Play slot game with 5 reels or 25 paylines. Chilli Heat slot game has an RTP of 96.52%. As mentioned above, Chilli Heat slot game is a Mexican themed slot game. This slot game comes with five (5) reels and twenty-five (25) paylines. Chilli Heat slot game is set on a backdrop of a street scene. 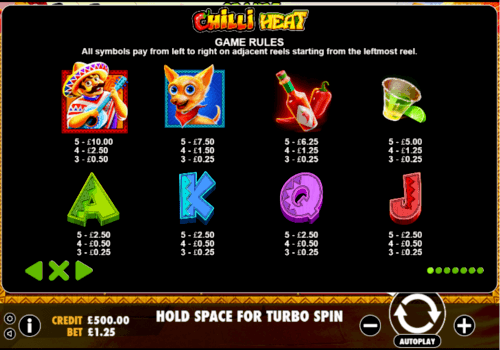 Like regular slot games, the Chilli Heat slot game has the lower value symbols which are; A, J, Q, K and 10. Along with these symbols, this slot game also comes with other symbols which include; Tabasco sauce, a Chihuahua, numerous glasses of tequila and a hombre playing guitar (this happens to be the highest value symbol on this slot game). The logo of Chilli Heat happens to be the wild symbol of this game and it can replace or substitute other symbols besides the scatter symbol and the unpopular money sack. Some of the features of this slot game include; the free spin feature, the autoplay feature, two high-value symbols and the bonus round feature. This slot game has the sun symbol which represents the scatter symbol. This 5 reels and 25 paylines slot game has a minimum bet of £0.25. This slot game comes with a bold and bright design and it is accompanied by Mariachi brass-heavy soundtrack. One of the best places to play this slot game is on our sister site, Amigo Slots which has a fantastic welcome offer of up to 500 Free Spins on Chilli Heat. If as a player you are lucky and six money bags appear on the game screen, you get a mini-spin. This mini-spin allows you to spin until there is no more money bags. The maximum payout for this wonderful slot game is 125,000 coins. This slot game comes with two jackpots, the minor and major jackpots. To win either of the jackpots, players will have to fill the five reels with the Pedro symbol. Another way to win either of these jackpots is to bet high. This slot game has a return to player percentage of 96.52%. This amazing slot game has certain bonus features that will definitely ensure that players get huge rewards and prizes. One of the features of this slot game is the free spin feature. The free spin feature is triggered when players land three scatter symbols on either the fourth, third or second reels. Once you land these scatter symbols, the player gets eight free spins, when the lower symbol reels have been removed more winnings will be triggered. If three more scatter symbols are landed, the player gets eight more free spins. Another bonus feature is the money re-spin feature. To trigger this bonus feature, players will have to land six of the money bag symbols anywhere on the reel. Once this scatter symbol is landed, each player gets three free spins and if he happens to land more symbols, the free spin is reset. When there is no new money bag, the value of the acquired bags are totaled and given to the player. If fifteen spaces are filled with the money bags, the player wins the jackpot. This slot game was developed by gaming software developer Pragmatic Play. With more than ten years in the slot game software development industry, this software developing company has shown that it can roll with the big boys. This company is developing games that are compatible with multiple devices. It offers players' games with different themes and multiple features. Pragmatic Play has developed over 80 slot games. Most of these slot games developed come with classic designs, but the newest releases show that the company is innovative and its just a matter of time before it stamps its place as one of the leading software companies. Some of the games developed by Pragmatic Play includes; Dwarven Gold, Sugar Rush, Tales of Egypt and a list of other fun and bonus filled slot games. You can find the Chilli Heat slot game and other games developed by Pragmatic Play at Money Reels. Taco Brothers is one slot game that has the same theme with the Chilli Heat slot game. Taco Brothers developed by gaming software developer ELK Studios is a Mexican themed slot game with five reels and 243 paylines or winning combinations. Grim Muerto is another slot game that has the same theme as the Chilli Heat slot game. Grim Muerto is a Mexican themed slot game developed by Play N' Go comes with five reels and 20 paylines. One game that is similar to the Chilli Heat slot game is the Big Five slot game. Like the Chilli Heat, Big Five comes with the free spin feature, the autoplay feature and other amazing bonus rounds which ensures that players win huge prizes. Aztec Rising slot game happens to be another slot game that is similar to the Chilli Heat slot game in terms of its features. The Aztec Rising slot game developed by Microgaming comes with an autoplay feature, a free spin feature, a scatter symbol, a wild symbol, and other amazing bonus round features. Aztec Secrets UK slot is another slot game that shares some features with the Chilli Heat slot game. This slot game has the free spin feature, the scatter and wild symbols and a couple of other rewarding bonus features. The desktop version of this slot game was first released before a mobile version was released. If you play this game either on the MoneyReels or any other gaming platform with your desktop computer you will notice that the desktop version is more appealing. Although the differences are not much, the mobile version is still very okay to play. The popular Mexican-themed 3x5 reel video slot game designed by Pragmatic Play which features 25 different paylines and a whole host of features including scatter symbols, wild cards and two different jackpots. Play Chilli Heat on Money Reels today which is home to over 550+ slot games. Chilli Heat invites you to the unique cultural landscape of Mexico; a country renowned for its vibrancy, fiery delicacies and extravagant fashion. Even though the title may suggest that the slot is food-orientated Chilli Heat manages to pack in plenty of different aspects of Mexico’s culture. Throughout the game play, you’ll get to see Mexican-themed symbols appear from friendly cartoon chihuahuas to Mariachi men waiting to serenade you with their Spanish guitar to bottles of hot sauce to burning hot suns. Chilli Heat packs in plenty of wild symbols which we will run through in more detail below. The game designer behind Chilli Heat was none other than the Malta-based slot developers Pragmatic Play, who proved that they know a thing or two about scorching heat after they released Chilli Heat in 2018. Since the release, the game has been a common feature on many ‘top Mexican online slot website’ lists as slot players didn’t fall short of appreciation for the visually stunning video slot. Short of donning a sombrero, welcoming a chihuahua into your home, or taking part in chilli eating competitions, there is no better way to add a little Mexican spice into your lives than spinning the reels on the new Chilli Heat slot game. Along with the heat of the slot’s theme, you can expect plenty of wild bonuses along with the multi-tier jackpot prizes. If you’re really lucky, you’ll see six money bags appear in the reels which will give you the chance to take part in a mini-sin, this feature will keep on rewarding you as long as more money bags appear on the reels. By this point, I’m sure you’re wondering why you should choose Chilli Heat over the other Mexican-themed slots, and the answer is simple, the popularity of the game mainly falls down to the dizzying jackpot amounts which can be won if you play the reels right. With a minimum bet amount of £0.25, the online slot can be enjoyed by high-rollers and those working with a budget too. Even if you start with a small bet amount the progressive jackpot prize can be astronomical; then it won’t be just the graphics which are bright and bold – after winning staggering amounts of money, your life will be too! The maximum pay out for the Chilli Heat video slot is a staggering 125,000 coins and with a Return to Player percentage standing at a generous 96% there really isn’t a lot to lose. If you already know your way around online slots, you’ll find that Chilli Heat has a fairly common set up to what you are used to. The 5-reel and 25-payline slot features five lower value symbols which you’ll see on the reels. For Chilli Heat the game designers opted to go with the lower values of 10, A, J, Q, and K. Even though you can win a fair amount of coins by matching the lower value symbols, what you’ll really want to watch out for are the tabasco sauce, tequila beverages, a charming mariachi man and the happy chihuahua. The highest valued symbol is the mariachi man who is proudly brandishing his guitar. The Wild symbol will pop up as the iconic symbol of the Chilli Heat game. In this game the Wild symbol has the ability to substitute or replace other symbols which can give you you a higher chance of cashing out. The only symbols which the Wild symbol won’t replace is the scatter symbol and the elusive money sacks. Yet, when it comes to exclusive features, it is the access to the bonus round which keeps avid slot players coming back for more. A free spin feature which treats you to a variable amount of free spins. To activate this feature, you’ll need to land three scatter symbols (the blazing sun symbol) either on the second, third or fourth reel. Once these have appeared on the reels, you’ll receive eight free spins. Once the lower symbol reels have been removed, you’ll be able to get your hands on the winnings which you can then cash out or use for another deposit. Every time you hit three scatter symbols you will receive eight more free spins. The Auto-play feature which will allow you to set a predetermined amount of spins after setting the stake amount. As we’ve said before the money re-spin feature on Chilli Heat is fairly rare, but it isn’t impossible to land. You’ll just need to land six of the money bags which can appear anywhere on the reels. Once the money bags appear, you’ll get three free spins to see if you can find any more of the highly sought symbols. When there are no more new money bags in sight the value of the money bags which you’ve snagged up to that point will be counted up and deposited in your account. To win one of the two jackpots in Chilli Heat you’ll need to fill fifteen spaces with the money bags. Another way to land the major and minor jackpots is to fill five reels with the Pedro symbol. If you’re serious about cashing out with a jackpot amount, always ensure that your bet stake is as high as possible. The only other Mexican-inspired slot machine which is currently available to play from Pragmatic Play is the Red Chili Hunter slot machine which we will compare against Chilli Heat below. Yet, the award-winning designer is responsible for over 100+ HTML5 supported games which are available in 78 different countries and 26 languages. Along with their online slot creations, you may be familiar with Pragmatic Play through their contribution to the gambling industry through their bingo games, live casino games and scratch cards. While the game designer may have plenty of competition, time and time again they’ve come out on top when it comes to ease of integration, reliability and innovation. The Malta-based designers have a tangible passion for creating premium entertainment which can be supported in over 13 different jurisdictions across the globe. Not every government is as lax as the UK when it comes to legislation on online gaming, yet, Pragmatic Play has ensured their video slots can be available in many of the world’s regulated markets. Whichever Pragmatic Play games you spin the reels on you can be sure that you’ll find plenty of in-house content which has all been created to be supported by Apple and Android along with web browsers which support HTML. With Pragmatic play, the mobile versions of the games are never released as an afterthought to the web versions, instead every game is optimised for online slot players who like to play on the go. The designers have put plenty of effort into each game to ensure that gameplay is optimised for the increasing amount of people who are choosing to play on their mobile or tablet. If you have played online slots for a while, you’re sure to have come across a Pragmatic Play game before, in recent years they have proven to be one of the most dedicated and innovative game designers. Their collection of popular and unique games currently includes Great Rhino, Da Vinci’s Treasure and the game which didn’t fail to pick up plenty of awards Wolf Gold. Pragmatic Play never gives their loyal fans a chance to get bored with their games, generally they release up to two new slot games each month. Even though they are prolific when it comes to publishing games, each of their games proves their dedication to maintaining a strong corporate culture. The games may make Pragmatic Play popular with online slot games, yet, their reputation as a leading multi-product game provider who cut no corners when it comes to cutting-edge solution is what appeals to online casino sites such as Money Reels. The online casinos are constantly working towards optimising their user experience, it is only natural that they will seek out games developers who are committed to putting customer support first. Red Chili Hunter 5 Lines is currently the only other Mexican-themed online slot to play via Pragmatic Play, yet it’s always worth checking their website and keeping up with the news of their releases. Red Chili Hunter 5 Lines is set on a Mexican farm instead of in a vibrant Mexican town. The set up of the 5x3 online slot is fairly similar but the unique gameplay experience will take you on a brand-new adventure! The story behind Red Chilli Hunter 5 lines explores a Mexican farm which is attempting to get away with growing genetically-modified and rare chilli peppers. To unlock the generous jackpot potential of the game search for three of the farmer’s sombreros which will have 200 coins stowed away beneath them. Alongside the sombreros you will also have to look out for the cacti which can reward you 5 coins each. It may seem like a small win yet those small amounts of coin soon stack up! You’ll also get the chance to snag three of the illusive chilli peppers and sell them on for a staggering 6000 coins – landing that will soon have you singing like a mariachi player. The RTP on Red Chili Hunter 5 Lines is slightly lower than with Chilli Heat at 93.51% but there are still plenty of other reasons to spin the reels on the spicy-themed game including the immersive gameplay experience, wild symbols and scatter cards. The high value and special symbols in this game include the cactus, sombrero, and chilli peppers, however sadly there is no bonus round in site. Yet if you’re looking for a slightly more straightforward slot experience, it’s well worth spinning the reels on Red Chilli Hunter 5. After other games developers saw the success of Chilli Heat, they wanted to see if they could cash in on the Mexican-themed hype which had swept across online casinos. Mexican-themed games aren’t exactly rare, but after the release of Chilli Heat, they are more popular than ever. The first clone of Chilli Heat is Taco Brothers which follows the same theme of the game, yet the games vary slightly when it comes to features and bonuses. The 5-reel slot game was designed by ELK Studios and gives players 243 different ways to win as they unravel the tale told by the game’s main protagonist Captain Diaz who seeks to step into town to steal all the tacos. Thankfully 3 hombres step in to save the town from being pillaged. If you thought that the story behind the game was exciting, just wait until the Wild Escape feature pops up with a variable amount of free spins along with the chance to win a 3x multiplier. The three brothers who have embarked on the quest will be aided by a Spanish Senorita who can release anyone who has been jailed as they go about their heroic endeavours. ELK Studios also treated fans of the Taco Brothers online slot to a festive reinvention of the game with their Taco Brothers Saving Christmas slot. Sure, it isn’t all too common to celebrate Christmas with Tacos, but those who love to defy convention are sure to find the game as immersive as the original. Grim Muerto is yet another Mexican-themed slot, which offers a simple online slot experience with 20 different ways to win. Play N Go aren’t the biggest games designer around right now, yet, with games such as Grim Muerto, they’re certainly playing their part when it comes to creating games to change the landscape of online slots. There’s a slightly different twist in terms of themes, as instead of sampling the sunny bright side of Mexico with Chilli Heat, you’ll be taking a much darker journey as you find out all about the Mexican Day of the Dead celebrations which is their own unique take on Halloween. Skulls are replaced with Sugar Skulls and death is not mourned but reflected on though joy. The graphics may not be as high quality as what you’ll get with Chilli Heat, yet the cartoonish vibe of the game certainly has its benefits and of course there’s plenty of Mexican-themed music to help you sink even further into the gameplay experience. Although the initial release of Chilli Heat was only for available via web browser, the mobile version quickly followed the release. Even though players now have the option between playing via their mobile or desktop/laptop, many still choose to play via web browser by accessing the Money Reels website. The differences may only be slight, but those looking for a seamless, graphically spectacular experience are advised to spin the reels via the website. Whether you choose to play on your mobile or via the web, you’ll notice that the soundtrack to the game is a massive part of the gameplay experience, so always make sure you have the volume turned right up for you to experience the true flavour of the game. To get started on mobile, tablet, desktop or laptop you’ll need to ensure that your device supports HTML5 to tap into the magic of Mexico. You’ll find that many devices already have the capacity to support Chilli Heat, yet, some mobile phones have been seen to struggle with the heat of the online slot and can quickly overheat. Since the Chilli Heat online slot was released in 2018 the award-winning game has had a fair amount of attention from the media who have thrown much deserved accolades upon the game. Even though the game developers’ Pragmatic Play release on average two new slot games each month, the release of Chilli Heat spiced up the release in more ways than one. On February 7th 2018, the game was first launched at the ICE trade show, they also prepared a chilli eating competition at their stand.